UK Whitley County Cooperative Extension presents "ARTifacts." Video by Jeff Franklin/UK Ag Communications. WILLIAMSBURG, Ky. (June 6, 2018) — An art exhibit is helping people in one southern Kentucky city gain a deeper connection to their history and to each other. The exhibit, "ARTifacts: 20 Decades of Whitley County," was designed by Cortney Moses, fine arts extension agent with the University of Kentucky Cooperative Extension Service. It is one of several bicentennial events occurring this year throughout the county. 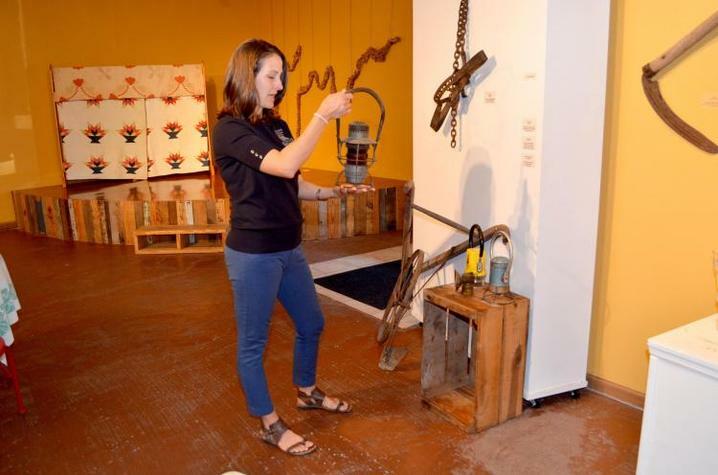 The exhibit features loaned items that have a connection to the county’s businesses, families and culture. Pieces include everything from century-old quilts to railroad lanterns to wooden toys. In all, more than 30 individuals and businesses provided items to the exhibit that is displayed throughout Whitley County Extension’s Community Arts Center in downtown Williamsburg. Jim Moss, a retired surgeon and Whitley County Fine Arts Extension Council member, loaned several colonial items to the exhibit including wooden vessels and Native American relics. Moses, who is also from Whitley County, said the exhibit has been professionally and personally enriching. The free exhibit is open 8 a.m. to 4:30 p.m. weekdays and is on display through June 29. The UK Cooperative Extension Service is part of the College of Agriculture, Food and Environment. Jointly with its land-grant partner, Kentucky State University, Cooperative Extension takes the university to the people in their local communities, addressing issues of importance to all Kentuckians. Cortney Moses, UK fine arts extension agent, at the "ARTifacts" exhibit. Photo by Katie Pratt, UK Ag Communications.